Happy Wednesday! Continuing on with my list of San Francisco’s Best Kept Secrets (the first one, here) with Shopstyle! I know the Ferry Building isn’t that much of a secret around here – after all, it houses some of the most popular longtime SF restaurants (my personal favorite is Slanted Door), and amazing merchants like Miette Bakery, Cowgirl Creamery’s Artisan Cheese Shop, Acme Bread Company, Heath Ceramics and Blue Bottle Coffee… There’s also a Farmer’s market twice-weekly and a killer waterfront view. From here, you can jump on a quick and easy Ferry that takes you to Sausalito, Tiburon or Larkspur. Can’t wait to go to San Francisco again and that color looks amazing with your hair! This color is AMAZING for summer! That shirt is what dreams are made of. Also I love me some San Francisco! I love the mint color on you! Love the color! Such a pretty outfit :)!! That color is so gorgeous on you! cute scarf! where is it from? I love what you’re wearing! Those sunglasses look fabulous on you 🙂 And I love Cowgirl Creamery! Great outfit, love your bag!! 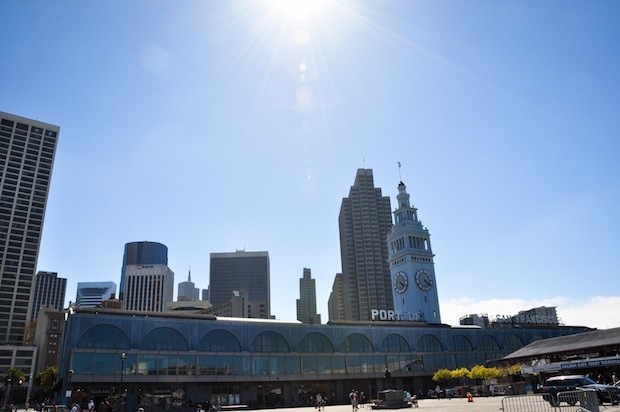 Love the Ferry building! Always a fun visit if I’m taking the ferry (to Alameda for a distillery tour). A perfect outfit as always. You look amazing! Gorgeous look. The color is amazing. What a beautiful monochromatic turquoise look. 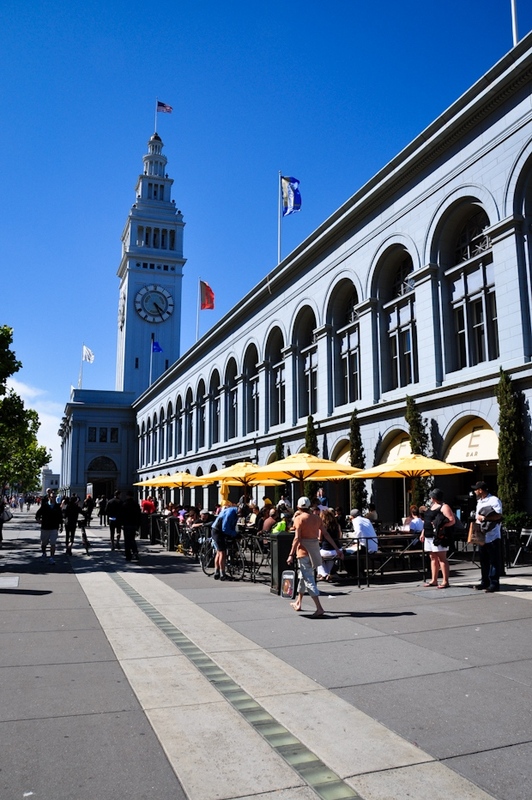 I love going to the Ferry Building when I’m in SF. I’ll have to check out Huntington Park next time I’m there. This looks like so much fun and I love your monochromatic look! You’re so gorgeous. This is such a cute maternity outfit, Anh! I love the Ferry Building. Another good SF kept secret, there’s Hiking Yoga, which is pretty cool. You can sign up for a session, and the group actually meets in front of the Ferry Building, you hike through some cool SF neighborhoods that has hills, stop and do some yoga along the way, and you end the session by doing yoga at the Coit Tower =) Definitely recommend! I love your teal on teal look! You think it would be overpowering to wear an outfit with one color but it works really well for you! Maybe it only works for certain colors? lovely mint color on you, im doing a mint look book this week be sure to check it out! Lovely summer outfit!!! You look so fresh and happy! Love the whole look and adoring your scarf!! Such a pretty look. Love the Farmer’s market at the Ferry Building. It’s got to be the best one I’ve been too. I love this outfit! Where did you get the scarf? 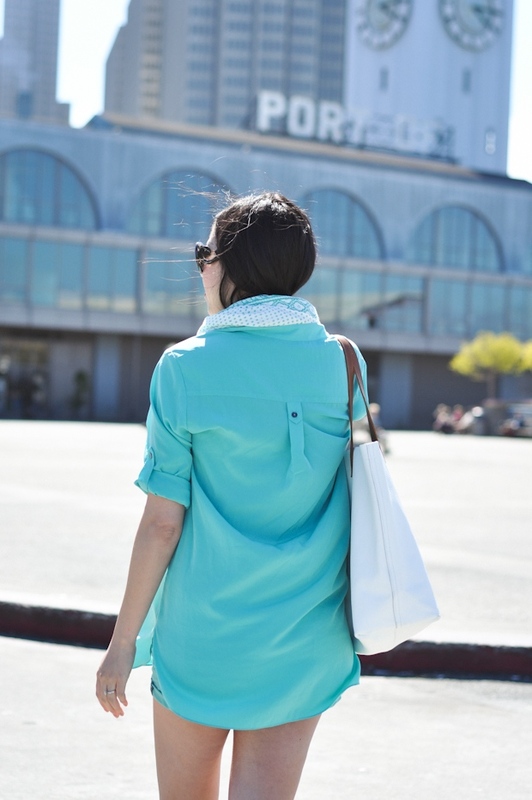 Have you had a positive experience with Stitchfix? I’m a little hesitant to try incase I dont like any of the clothes and I still have to pay! about this topic that’s been uncovered .computing Thanks for your shearing nice photo. <3 <3 ferrry building especially on tues/thurs/sat :) my favorite SF secret too ! Nice blouse and matching shorts.